Frame #1: The right arm entry occurs while the left arm is in the early stages of propulsion. The arm enters flat and slightly bent at the elbow. The right leg kicks to counter-balance the vertical forces created at entry. The left arm is well in front of the shoulders and displays a partial "elbow-up" position. The left forearm is still being positioned to be almost vertical to the line of propulsive force. One should not use this position as justification for an "overtaking" stroking style (see discussion at the end of this commentary). The shoulders are flat. The left arm pull is almost solely reliant on the internal rotators of the left shoulder. The head looks forward which is the characteristic position assumed after breathing. A strong argument could be made to recommend changing this head position. The body position of the swimmer is streamlined which accommodates his unusual physical height. Frame #2: The right arm entry continues and the arm sinks slowly. The right leg continues its kick to counter-balance the upward hydrostatic forces created by the arm's entry. Left arm propulsion is achieved by strong adduction of the inwardly rotated upper arm. Significant bending at the elbow increases the power of left arm propulsion. In this position the left hand/forearm is quite close to the body and producing mainly horizontal drag forces. The right leg is raised preparatory to kicking. The head tilts forward. Frame #3: The entered right arm straightens after sinking a little more. The left arm pull continues with adduction of the upper arm continuing and the forearm being maintained close to vertical to the direction of propulsion and under the body. Rotation of the upper left arm brings the hand/forearm surface close to the body. The left arm pull produces forces that would rotate the shoulders and torso to the left and so, to counter-balance that rotation, the right leg begins to kick. The head continues to tilt forward and down. Frame #4: The right arm has been gradually sinking, which at this stage would cause a problem if it continued. To halt the sinking, the hand is tilted slightly upward to create a lift force to maintain its position near the surface. Increased turbulent bubbles following the back of the hand evidence tilting. The left arm pull continues in a horizontal plane. The hand/forearm surface is very close to the body as adduction of the upper arm by the internal rotators is virtually complete. The right leg kicks to slow body rotation to the right while left arm propulsion continues. The right shoulder is lower than in the previous frame. This frame demonstrates a position of "extreme" stretch that is indicative of all elite distance-crawl-stroke swimmers. Frame #5: The right arm continues in its extended position with the finger tips raised even further (see how the thumb has opened further from the palm). The turbulent bubbles on the back of the right hand and forearm have increased. The left propulsive arm commences extension at the elbow. This causes the hand/forearm surface to slip slightly sideways so that the arm will clear the hip when it eventually exits the water. Since the angle of the forearm continually increases, primarily the hand maintains propulsion. The right leg has completed its kick while the left leg begins to kick. Frame #6: The right arm is re-positioned to commence propulsion. The wrist is flexed and the turbulence bubbles follow its tilting path. Relative to the surface, the elbow of the right arm is angled slightly toward it. The left leg kicks to counter-balance the vertical forces created by the right hand. The left arm is rounding-out preparatory to exit. Because of the extreme forward reach and increased shoulder roll, the face and head are partly inclined to the left. The right leg rises. To this stage, the streamlining of the swimmer has been very noticeable. Frame #7: The right arm repositioning is complex and underway. The upper arm is medially rotated while the shoulder continues to roll downward. The elbow and wrist continue to bend. The left leg kicks to counter-balance the rotational and vertical forces created by the initial right-arm movement. Only the left hand remains in the water as the left arm initiates its recovery. The right leg continues to rise. Frame #8: This is a picture that should be shown to every aspiring distance swimmer. The right arm is in a position that is worthy of emulation. The upper arm points slightly toward the surface as it medially rotates and continues to be sustained in a position that is as far forward as possible. This position is achieved even though the right shoulder has continued to rotate downward. On the swimmer's back and at the base of the upper arm there is a light patch indicating muscular contraction. It shows how much the external rotators of the shoulder are involved in achieving this position. The right forearm and hand approach verticality while the upper arm is positioned for maximum adduction. These two movements produce a stroke that will commence at maximum effective length forward. Arching of the lower back shows how much effort the swimmer is exerting to achieve this position. The right leg kicks to counter-balance the vertical forces created by the recovering left arm in its early stages. Frame #9: This is the second picture that should be shown to every aspiring distance swimmer. The right arm is in a classic "elbow-up" position. The right hand/forearm surface propels the body forward by applying force backward. Both the internal and external rotator muscles adduct the right upper arm. The right leg kicks as the left arm approaches entry. If it did not kick then the body would rotate away from the right and take the right arm out of its effective propulsion position. Frame #10: The right arm continues propulsion. Upper arm adduction is virtually completed and the hand/forearm is close to the body. There is a momentary hyperextension of the upper back as the head begins to be lifted prior to turning to breathe. This disruption to streamline is undesirable. The left arm enters upper arm first as out-of-the-water recovery is completed and the right leg completes its kick. The right leg kick, right arm pull, repositioning of the head, and drag from back of the left leg cause the body to rotate quickly to the left. Frame #11: The right arm begins to extend at the elbow as propulsion continues. This causes the hand to increase its importance for maintaining propulsion as the lower arm rotates away from under the body because of elbow extension. The head starts to turn to the side. The left arm enters with the hand tilted slightly downward. Frame #12: The right arm continues to extend backward with the hand providing propulsion. The right elbow is out of the water. The left arm slowly presses downward in its lengthened position. The right leg begins an abbreviated kick. Hips and shoulders face the right. The head is almost turned. Frame #13: The right arm and hand have exited. The left arm is still extended forward and continues to slowly press down. Some flexing at the left wrist occurs. The right leg is performing an abbreviated kick. Breathing begins. Frame #14: The recovering right arm most likely swings to the side because the alignment of the swimmer's body and legs is curved more than at any other stage in the stroke. Inhalation continues. The left arm continues to press down as well as beginning to bend at the elbow. Frame #15: Left arm propulsion increases as adduction of the upper arm, elbow bending, and hand positioning occur. The right arm is well past maximum height on recovery and approaching the water. The left leg is positioned to kick. Breathing is completed and the head begins to return. Frame #16: The head is turned very quickly and looks forward instead of down. The upper right arm begins to break the water surface as entry commences. The long left arm continues to press down and slightly backward. It is likely that the downward component of this pull will counter-balance some of the vertical force component of the entering right arm. Consequently, the left leg kick is smaller than that exhibited by the right leg at left arm entry. Frame #17: This position is near that depicted in frame #1. The stroke cycle begins again. This is not an overtaking stroke. One of the major factors governing individual style is a swimmer's physical attributes. Technique differences between champions are usually determined by the necessity to accommodate peculiar physical dimensions while adhering to basic mechanical principles. In the case of Grant Hackett and Ian Thorpe (see Thorpe's separate analysis), both are physically immature, exceptionally tall, and highly ranked in distance events. A problem that confronts tall, thin distance swimmers is the difference in duration between recovery and propulsion, the former being much shorter than the latter. These two examples show that a fast recovery is made, probably to reduce the time that its vertical forces are influential in the stroke. 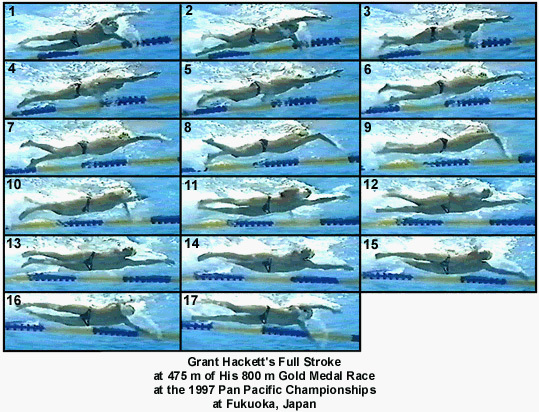 In Grant Hackett's case, the duration of both arm recoveries is in the vicinity of .4 seconds. However, the time spent by both arms in the propulsive phase is longer and so the recovered arm "has to be put somewhere." The end of the recovery consists of stretching forward long and straight under water while the other arm completes its propulsion. This movement is not made to "reduce resistance" or to "enhance streamline." It simply is done to accommodate the length of time this shape of swimmer takes to complete propulsion. It is positioned in the water to minimize the transitory added resistance that results from increasing the wetted surface of non-propulsive surfaces of the swimmer. Swimmers of different shapes and physical proportions might not be required to perform with this restriction. overall length of the effective pull.